A strong platform. An ultra-modern plant with state of the art production technology. A skilled partner for your tasks and needs. Milestones from over 90 years of company history. The department for construction and industrial machines is founded. The first Kramer wheel loader with a bucket is developed and receives the product designation KS510. The driver can safely change attachments in seconds, directly from the driver's seat. With this innovation, Kramer brought about much more than just an increase in the operator's ease of use. The design of the wheel loader range evolved and, at the same time, compatibility with various types of add-on equipment was ensured. To this day, the quick hitch is one of the best and most effective systems available. Add-on equipment that was developed for the first Kramer wheel loaders is also still compatible with the very latest generation machines. This development significantly accelerated the working speed on construction sites. ... is how long it takes to change the add-on equipment with Kramer's hydraulic quick hitch system. Achieve great improvements with little effort: A container filled with nitrogen dampens the vibrations of the loading system. The result: smooth ride characteristics and the bulk material always remains in the bucket, even if the terrain is uneven. Due to the damping function, both the driver and machine enjoy a smooth ride because all shocks are well cushioned. 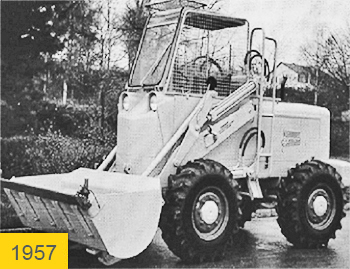 After discontinuing tractor construction (1973), the legendary 12-series wheel loader is introduced in the market. Kramer develops an attachment that, in addition to the traditional bucket work, can also fill trenches on tight construction sites, because the bucket can be placed at more than 90° through the use of a cylinder. This clever solution leads to a boom in demand and still asserts itself today. makes the side swing bucket extremely flexible, particularly in confined spaces. The Kramer 312 SL is the first wheel loader that goes into series production with all-wheel steering. It was the best-selling wheel loader of its time. There are no suitable axles for realising this concept. So Kramer simply develops one. The all-wheel steering and one-piece frame have enormous advantages in terms of stability, manoeuvrability and off-road capability. Kramer wheel loaders can safely carry just as much material driving in a straight line as they can when cornering. The system proves itself and Kramer wheel loaders assert themselves on the market. Kramer reacts to customer requests for more dumping height and range. Kramer can easily implement this desire through the one-piece frame. The loader remains stable, even with 1.5 metres more dumping height. The tele wheel loaders now have a permanent place in the Kramer product portfolio and are particularly in high demand in municipalities and recycling companies. Clear plus: 1.5 m more stacking height due to the telescoping loading system. Kramer presents the first wheel loader series with an infinitely variable high speed transmission. Kramer has been offering its wheel loaders with hydrostatic ecospeed transmissions since 2003 and its telescopic handlers with hydrostatic ecospeed transmissions since 2005. This is a high speed transmission co-developed by Kramer that runs continuously up to 40 km/h. The advantages are optimised tractive forces, minimised fuel consumption and particularly sensitive machine control. Kramer's one-piece frame also proves its superiority here. It creates the technical conditions so that the machine receives European-wide approval as a motor tractor / agricultural tractor. In connection with a pressure air-brake installation, up to 20 tonnes of material can be transported. This unique selling point gives Kramer a significant competitive edge. In connection with the continuously variable, ecospeed high speed transmission, the vehicle is even more attractive: Kramer machines are not just approved as motor tractors / agricultural tractors, but also fall into very favourable insurance and tax brackets. Kramer expands its product range and develops its own telescoping series for the construction industry, recycling companies and industry. New in the market: the innovative 'smart handling' driver assist system for increased operating safety of the telescopic handlers and an efficiency increase in the employment of labour. Kramer launches the new compact geniuses among wheel loaders on the market, the 550 and 650.